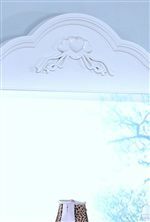 The bright white finish over select veneers give this headboard a feminine essence. Adorned with carved finials, turned legs and picture frame mouldings this bed has a unique look. Cute heart shaped appliques complete the design and make this bed the perfect addition for your little girls' room. The Megan Casual Twin Panel Headboard by New Classic at Casa Leaders Inc. in the Wilmington, Long Beach, Torrance, Lakewood, Los Angeles area. Product availability may vary. Contact us for the most current availability on this product. The perfect combination of feminine accents and detailed construction make this bedroom collection perfect for your little princess. A bright white finish is accented by pink acrylic knob hardware for a fun, girly look. 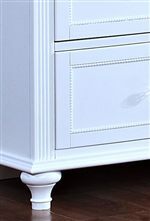 Adding to the casual style of this collection are intricate carved finials, fluted pilasters and heart shaped appliques. This collection features a bunk bed or panel bed option to give your child exactly what she is looking for. The Megan collection is a great option if you are looking for Casual furniture in the Wilmington, Long Beach, Torrance, Lakewood, Los Angeles area. Browse other items in the Megan collection from Casa Leaders Inc. in the Wilmington, Long Beach, Torrance, Lakewood, Los Angeles area.